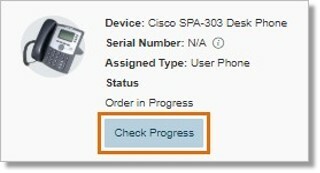 On the Admin Portal page, click Phones & Devices under Phone System. Click the tab where the device to track is under. Hover on the device that you wish to track and then click Check Progress. You can also click on the device that you wish to track, and then click Check Progress to view the Tracking Number, or the Date Received, if the phone has been delivered. If you have not received the phone that you ordered from Office@Hand from AT&T, go to http://www.fedex.com/us/track/, and then enter the Tracking Number that you got. Note: Your desk phone(s) will arrive approximately five (5) to seven (7) business days from the day of ordering. After order processing, procurement and packaging, we ship through FedEx or USPS ground, 2-day or overnight delivery. The best part is that the phones arrive Plug & Ring ready so all you have to do is plug them in and start making calls. The Travel History page will provide you details if the device is already delivered or where is it located as of the moment.